Your praise regarding our dining experiences, amenities, and outstanding hospitality are all deeply appreciated! Thank you for choosing our beachfront resort and we hope to have the pleasure of welcoming you back in the near future. We booked a weekend getaway at Hilton Ft Lauderdale beach during the busy spring break season. Despite the crowds, the valet quickly checked us in and the front desk gave us our keys within minutes. Everyone was super friendly from the bell man to the housekeepers, wait staff and more. In fact, I started to wonder how they attracted such great employees. A standout experience for us was during breakfast and lunch at the Ilios cafe. The cafe has indoor and outdoor seating and sits next to the pool with a view of the ocean. Arlene was our server both days and she was fantastic! It’s like she read our minds and thought of everything before we asked. Also, Cohen made wonderful omelets and went above and beyond to address our dietary restrictions. The rooms were clean and I highly recommend an ocean front room. 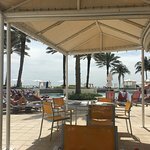 All in all, I highly recommend the Hilton Ft Lauderdale beach and I believe it rivals many newer, pricier options. My only critique is that if you rent a car, the only parking option is valet which is around $42 per day. However, I believe that’s in line with most beach front properties. We will return! We are pleased to read that your stay left a lasting impression on you! It’s always a treat when our guests take the time to let us know how much they’ve enjoyed so many of the qualities that make our resort special, from our hospitality to our on-site dining options. Your kind words and feedback are appreciated and we look forward to taking care of you again next time you’re in Fort Lauderdale. Walter and Malcom are amazing. They work at the front desk and took care of our every need. Definitely ask for them if you need anything! Whether it’s a good recommendation for dinner or getting a bottle of water. The hotel is a great location and the rooms are very nice. Also be sure to wish Walter a happy birthday bc his birthday is March 18! Thank you for staying with us and for sharing your experience! We are pleased to know that both Walter and Malcolm stood out among our excellent team. We will be sure to pass on your birthday wishes and hope that you’ll join us again soon. Value for money? In FLL, this hotel wins hands down. We thoroughly enjoyed our 42 night stay in the 1-bedrm suite #2005. The long balcony enabled terrific views of both the beach and the intercoastal, but what made our stay memorable was the excellent service by all of the staff we encountered, including the very professional front office, the concierges, and even the connected Le Marche and S3 restaurants. Special thanks to Alexa K at the front desk, as well as Greg A and Donovan F. From our hotel location we could do daily walks along the interesting A1A to multiple dining spots like Ibiza, Lona, Boccaccino (with magnificent secret recipe spaghetti sauce and wonderful waitresses), and the Primanti Brothers (who could not be a friendlier neighbourhood spot!). Functionally for those who plan to use the kitchen, we'd pick up our breakfast&lunch grocery supplies from a CVS under a mile away, and less often we'd walk up to the Galleria mall and large Publix supermarket. Our longest walk was 3 miles along the beach to catch the Sunday 4 pm convoy of six monster cruise ships steaming out of Port Everglades. January weather was perfect, with a light breeze, and few rainy days. By Feb 25 however, the temp had climbed over 90F so we headed home a week earlier than plan. Functionally everything worked fine in the rooms, and the main bathroom was bright and expansive for daily showers. Now for the Debbie Downer part: the #2005 kitchen needs upgrading (appliances, utensils) but was fine for light meals. And note, FLL is not silent Tahiti, so you will often hear sirens at night, trucks backing up, and muscle cars dragging on A1A; that comes with the turf of every beach town. On behalf of our team, thank you for choosing our beachfront resort as your Fort Lauderdale home away from home! It was our pleasure to provide you with everything you needed to fully enjoy your time in South Florida and we’re glad to know that our property’s central location made exploring the area very easy. We appreciate you sharing your feedback on where we can make improvements and will be sure to discuss your comments internally. Our team is pleased that your trip exceeded expectations and we invite you to reach out to us if you should need any help making return arrangments. I had the pleasure of meeting Edward Thornton,who is a concierge at The Hilton, he was extremely helpful to me on my recent visit! The resort was very welcoming, always clean a.d the staff was always available! We loved the staff on the patio as well!! We will definitely be back!! We are pleased to know that our team’s hospitality stood out to you during your trip! It would be our pleasure to take excellent care of you again and we invite you to contact us if you need any help planning your return. Great location. Giant rooms, the room had 2 full rooms, bedroom, big-bathroom and a suite. This allows walking distance to many restaurants and the beach. The views are great. The front staff at this hotel really stood out. They offered fantastic service. I enjoy getting a text prior to my stay and during my stay to make sure I am happy. I love that service. This is close to the airport too. We are glad to know that so much of what makes our resort special helped to make your trip to Fort Lauderdale unforgettable! Your compliments on our spacious suites, convenient location, and hospitality are greatly appreciated. We look forward to treating you to another exceptional stay next time you find yourself in the area!